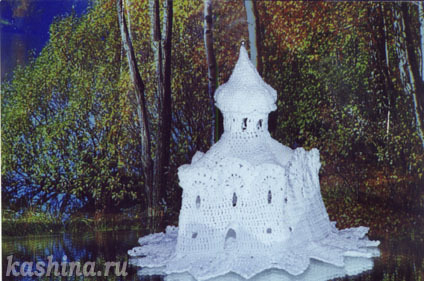 I was inspired for creation the lacy architecture by my visiting Spaso-Preobrazhensky Cathedral in Pereslavl Zaleski and so Church Pokrova at Nerl river. 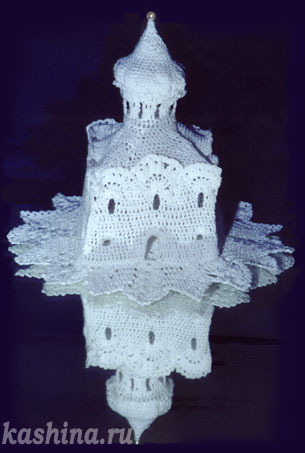 The church is crocheted by one thread from its base till the top, without stitches. The cupola of the lacy church is decorated with a pearl pin. The church was starched by special technology that is our family secret now. Height 18 sm, base diameter 18 sm. 1999. Pereslavl Zaleski is a small Russian town with an ancient history. There are six monasteries and a lot of churches in town. Spaso-Preobrazhensky Cathedral in the Pereslavl Kremlin was laid by Jurii Dolgorukii in 1152. It was completed during the reign of Andrei Bogolubskii in 1157. So, its the oldest architectural monument of the North-West Russia. There were many Pereslavl princes christen in this cathedral, including famous Russian prince Alexander Nevskii in 1220. During the XIII-XIV centuries Spaso-Preobrazhensky Cathedral was a burial-vault of Pereslavl princes. Now there is the Museum of Alexander Nevskii in this cathedral.